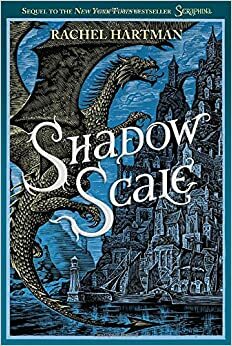 Shadow Scale is the follow-up to Rachel Hartman's Seraphina, set in a world where humans and dragons live uneasily together. In Shadow Scale, our heroine Seraphina sets off to find other half-dragons like herself in an effort to help the Goreddi war effort. But a powerful enemy also wants to reach the other half-dragons, and the only way to combat her is for Seraphina to let her own powers loose. One of my favorite things about Seraphina was the way Hartman built complex political and religious systems for Goredd. The world-building was amazing. That continues here in Shadow Scale, to an even greater extent, as Seraphina travels beyond the Goreddi borders and learns more about other cultures and belief systems. Religion was important in the first book but takes an even more central role in this one. Add to that the politics and the languages and the dress codes and all the rest and you have a world that comes completely to life. Unfortunately, in my opinion, the characters didn't quite keep up with the setting. A few of my favorite characters from the first book, mainly Princess Glisselda, were hardly present at all in this one. Instead, we follow Seraphina on her journey from one place to another, never staying long enough to understand the location, and never spending a meaningful amount of time with the newer characters to get to know them. It felt like we were just crossing items off a list without any real character depth or growth. The only character who did get depth (and, in my opinion, way too much airtime) was Seraphina's nemesis. She shows up early and then never leaves, and I grew tired of her pretty early on. After getting about halfway through this book, I started skimming pretty significantly. I just couldn't concentrate enough on the story. I really enjoyed the setting and some of the religious stuff was really fascinating (though in general, I don't like books in which religion plays a big role), but the plot and characters just didn't pull me in. However, there are people who feel very differently! Ana wrote a glowing review of Shadow Scale, and you should check that one out as a counterweight to this one. Note: I received a free audiobook CD of Shadow Scale to review from the publisher. However, I read the hardcover version of the book, not the audiobook, and my review is based on the hardcover version (which I checked out from the library). I heard similar views about this book. I still haven't read Seraphina yet, though it's on my "one day" tbr list. I just found a copy of this, after Ana's glowing review, so now your review will temper my expectations a little bit. Yeah, my response was similar, as you know, and it's such a disappointment. I wanted to love Shadow Scale so much! Maybe after my initial negative reaction has died down, I can go back and try again with it. Do we know if Rachel Hartman is going to write more in this world? I think my only problem with this book was that the villain was just WAY TOO VILLAINOUS for the story. I can't explain exactly why except, like you, I thought she got too much screen time, so to speak, and I started wanting to put down the book each time she appeared. Still, everything else was fascinating and interesting and I quite enjoyed the story on the whole. I haven't read this one yet, and to be honest, I'll have to re-read Seraphina before picking it up. I remember loving it but not much more than that. Bummer! I like Seraphina a lot... Do you think it suffered from being the middle book in a trilogy or something? Sometimes those middle books can drag because they're just sort of moving you along.